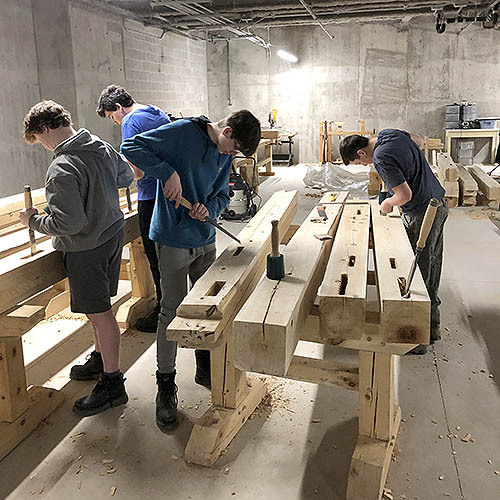 The Trinity College School Woodworking Club is back in the shop again for the spring term and continuing the work on this year’s major project, which was started in fall 2018. Specifically, the student carpenters have been working diligently to keep pace on the 16' x 16', two-tiered, timber framed pergola that will be situated in the garden area outside of Cirne Commons. The pergola is constructed out of 8" x 8" white cedar and the TCS Parents’ Guild has generously provided the funding for the project. The last of the mortise and tenon joinery was completed on the weekend and the carpenters are currently drilling the peg holes and doing the final fitting of the various sections. All in all, 54 mortises, 18 tenons and 18 knee braces were constructed along with 68 peg holes – no small feat, to say the least. Next, the top slats will be ripped to the proper width and the end profiles cut before embarking on the tedious (yet ever so important) process of sanding. If all goes as planned, the frame of the pergola will be installed by mid-May, with the staining and two layers of roof slats to be completed shortly thereafter.